It’s officially starting to feel more like autumn all across the nation—and not just because pumpkin has seemed to creep its way into basically every edible and drinkable substance. People are breaking out their jeans, boots, and sweaters, college students are in the midst of taking midterms, and some people are already trying to figure out plans for the Thanksgiving holiday. Many are asking the same question: should I really go home for a somewhat long weekend? Even if you don’t go home, here are three reasons you should definitely go somewhere! Even you don’t get that far from your living area, if you can spend a couple extra dollars, go somewhere to eat for a bit of home-cooking. Even if you don’t go somewhere on Thanksgiving, get a home-style meal and share it with friends. Your version of Thanksgiving on a budget may consist of a turkey sandwich, jarred or canned cranberries, instant mashed potatoes, frozen peas and carrots, a pre-made salad, and a Basic Southern Bread Stuffing. 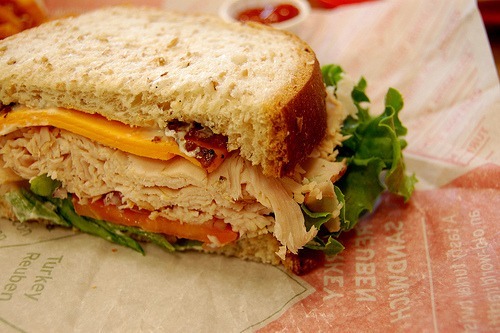 For some delicious turkey sandwich recipes that are sure to make your mouth water, check these out. No one said Thanksgiving has to be expensive. If you are lucky enough to get away for the holiday and spend it with friends and family, bring a delicious dish to share. I come from a really big family—I have 17 first cousins just on my mother’s side, plus some of their spouses and significant others, plus all my aunts and uncles, so there are usually about 40 of us for Thanksgiving. Needless to say, we have a long line of tables stuck together that is designated the “kids’ table” where all the cousins sit. But despite having to feed an army, there is always plenty of amazing food. Everyone signs up to bring something. The aunts get in a “bread war” with platters of assorted cheese and fruits, the cousins make giant salads (Chinese chicken salad with slivered almonds and mandarin oranges, Kale salad with roasted sweet potatoes and goat cheese, Spinach salad with pecans and walnuts, dried cranberries, and a vinaigrette), the uncles grill giant prawns with a garlic-herb butter and pan-fried abalone steak sandwiches with pesto and tomatoes—and most of those are just the appetizers. In any case, bring a scrumptious dish for everyone to share. You may not have to feed 40, but make something that works well with your budget and that you enjoy preparing. The prep time is probably most of the time you’ll be spending in the kitchen, so make sure it’s something you really want to make. Turn it into an activity if your best friend or significant other is willing to help you—switch on some music and get cooking. Yes, we all know that the Thanksgiving break is usually very short—sometimes only an extra day or two. But it is a break, no matter how short. It may be spent stuck in some holiday traffic getting to and from your destination, but make the trip with friends or at least have some your favorite music so you can jam in the car. You may weird out other drivers—it’s kind of a given that you will if you’re dancing along to some Ke$ha and Lady Gaga or even throwing it back to Backstreet Boys, N*SYNC (Yes, it is possible to like BOTH), and ’90s Britney Spears, but you’ll make the grueling hours enjoyable.